The Liverpool boss was delighted to see Roberto Firmino strike after six games without a goal. Liverpool manager Jurgen Klopp and Roberto Firmino. 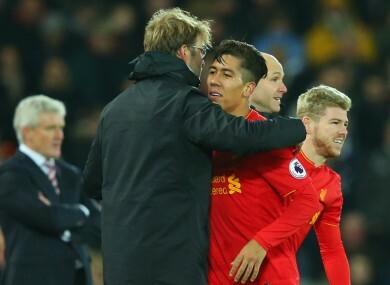 JURGEN KLOPP BELIEVES it was important for Roberto Firmino to score in Liverpool’s 4-1 win over Stoke City tonight after a difficult time both on and off the pitch. The Brazil attacker had gone six games without a goal heading into the clash at Anfield and made headlines for the wrong reasons this week when he was charged with drink driving. Klopp refrained from commenting on Firmino’s personal troubles but was delighted to see him rediscover his scoring boots. “Firmino played really well and he really deserved his goal,” Klopp told Sky Sports. “I cannot speak about his off-pitch issues, but he has been having a hard time on the pitch in recent weeks. Firmino was not the only Liverpool forward to score a confidence-boosting goal, with Daniel Sturridge getting his first Premier League goal of the season just minutes after coming off the bench when he capitalised on a stray Ryan Shawcross backpass. “Sturridge’s was goal really important as well,” Klopp added. “It is good to see he is back and fit. We are losing Sadio Mane during the Africa Cup of Nations, so it is important to have Daniel back. Although Liverpool eventually cruised to a comfortable win, they struggled in the opening 30 minutes and went 1-0 down when Jonathan Walters took advantage of some poor defending. “It was a very difficult game, but a good result in the end,” Klopp continued. “That Peter Crouch was starting for them was a sign of how they wanted to play. We could have done better in defence. Long balls are always hard to defend, so it was difficult. “We should have done better for Stoke’s goal. Mane was already there to collect the second ball. But it was a very good cross and a good header. You have to avoid crosses there, but we switched off for a moment. Email “Klopp hails Firmino as he puts 'off-pitch issues' to one side to end goal drought”. Feedback on “Klopp hails Firmino as he puts 'off-pitch issues' to one side to end goal drought”.